After reading this The Secret of Great Bread: Let Time Do the Work By MARK BITTMAN http://www.nytimes.com/2006/11/08/dining/08mini.html?pagewanted=1&_r=1 and watching several videos,blogs, I decided to try making it cos i have now own a Schlemmerpotf . I would have tried to make this when it was first introduced by Jim Lahey, 2 years ago, if only i could afford a Le Creuset enameled cast iron pot. 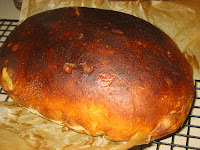 After seeing this handsome guy making this bread here http://steamykitchen.com/blog/2007/09/10/no-knead-bread-revisited/. I fell in love with him at first sight and he inspired me more to tackle this bread. Thanks Steamykitchen,for all the tips posted in your blog and give my handsome guy a big big hug. I showed that post to Alexander and he said 'me help', 'me can do'. Alexander The Baker went into action. The crust for the first try did not crackled as the second try, perhaps the clay-pot was not hot enough after 1/2 hr preheat, so i gave it another extra 1/2 hr. 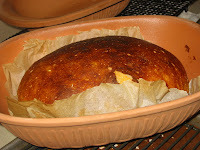 The second bread was crackling as soon as it was turned out onto the cooling rack. I used bread flour for the first bread and let it rest for 18 hrs as suggested. The second bread, i changed to unbleached all purpose and the resting time to 12 hrs. 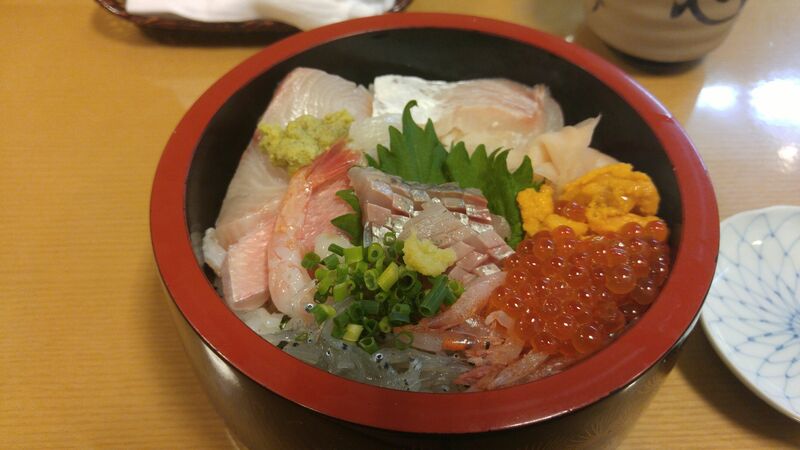 I did not find any difference in the texture and taste. I added 1/4 tsp of salt as food tends to be more bland with altitude. The recipe calls for 1 5/8 cups water, i used 1 1/2 cups and wet my hands as often as possible when handling the dough, so that should take care of the 1/8 cup of water. The third try, i replaced 1 cup of flour with whole meal flour and the taste was so good, even the color of the bread was more appealing. Add 1 1/2 cups water, and stir until blended; dough will be shaggy and sticky. Cover bowl with plastic wrap or put the lid on if the bowl has one. Let dough rest at least 12 hours, preferably about 18, at warm room temperature, about 70 degrees. 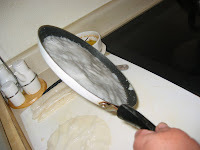 Dough is ready when its surface is dotted with bubbles. Generously sprinkle cornmeal onto a 12 inch piece of parchment paper; put dough seam side down on parchment paper . 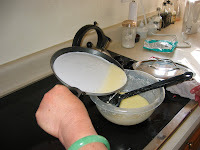 Lift the parchment paper with dough on it and place onto a basket and place basket and all back to the large bowl. Put the lid on and let dough rise for about 2 hours. If using a cast-iron skillet, preheat the skillet at least a half-hour before dough is ready. I am using a claypot and i preheat for 1 hour. Heat oven to 500 degrees(i use convection roast). Put a 6- to 8-quart heavy covered pot (cast iron, enamel, Pyrex or ceramic) in oven as it heats. 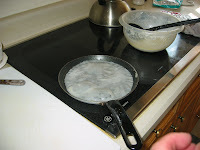 Lift the parchment paper with the dough on it and place on to hot pot and cover with the lid. Bake 30 minutes, then remove lid and bake another 15 to 30 minutes, until loaf is beautifully browned. This pastry is so unique, it is flaky and the layers run horizontally . I can't even describe it, it is so amazingly attractive. I had to learn how to make it. I found this on Youtube http://www.youtube.com/watch?v=BWvqzpxiZMI. Please watch this video before you attempt to make this as the method in the recipe did not make sense until you have watched how it is rolled. Heat oil and saute radish, cabbage, black fungus, minced pork, spring onions, Ginger and dried prawns until fragrant. Set aside to cool. 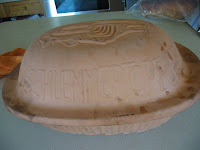 Place second dough in the middle of the first dough and bring sides up to enclose. Roll combined dough out and fold in the sides then roll out again. Repeat the process of folding and rolling out the dough a few more times. Leave dough in the refrigerator for 1 hour. Roll chilled dough out and fold dough in half and roll up tightly from the shorter end as with a swiss roll. Cut into 12 equal slices then halve each slice horizontally to get 2 semi-circular pieces. Stand each semi-circle on its freshly cut side. Using your palm, press each semi-circle down to flatten then roll each one out into a long strip. Repeat to make more puffs. Heat oil for deep-frying. Fry puffs for 3 - 4 minutes over LOW HEAT. When puffs are golden brown, increase heat briefly. This reduces the absorption of oil into the puffs and also ensures that they are crispy. After many attempts to get the chee cheong fun that i fancy, i have come to this one that i like. My friend, Kimmie, who is of Vietnamese decent served Banh Cuon at her son's birthday party and i liked it better than the cheong fun served at dim sum, as it was so delicate and smooth. I have made it with Banh Cuon premix and it turned out great if it is done right, that is, very very thin. The suggestion in the premix is to use 4 cups of water to the whole pack which is 12 ozs/340 gms, i wonder what is the proportion of tapioca/wheat starch/potato starch to rice flour that is in the whole pack? Anyway, i have found a video for banh cuon trang chao http://video.google.com/videoplay?docid=2472585946606212957&q=&hl=en and obviously did not understand a word of what she is saying but i could figure out the recipe and gave it a go. She used 5 cups of water to 1 cup of rice flour and 1/3 cup of tapioca starch. 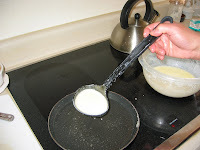 Her method of using the frying pan is the easiest way to make cheong fun. Mix all the ingredients together and leave aside for at least 1/2 hour before making the banh cuon following the method above. 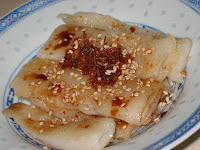 I like to serve banh cuon like chee cheong fun with the hoisin sauce and sesame paste. The Penquin Cake was for Jessica who turned seven and Dora Cake was for Allyson who was three. The Butterfly Cupcakes were for Renee as she was into butterflies and ladybugs this summer. Heat oil, add in chopped ginger and chopped garlic. Saute until fragrant then add in hot bean paste. 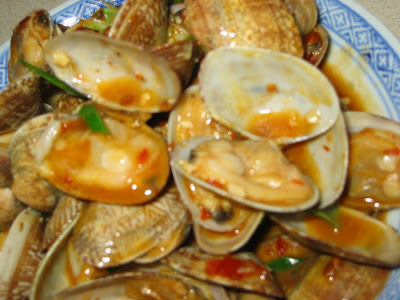 Add in the frozen clams and stir fry. Add in the shao xing wine and cover the wok for 1 minute. Add sugar to taste and spring onions.